Think of the Hunker House as a place that exists only if the website could transform itself from an internet platform into a dreamy, real-life space in Venice, California (because, of course, AI would know where to snag the best LA real estate). The perfectly styled bookcase is one thing, but the bedroom is a whole other dream-space to explore. There's no noise, apart from the impeccable sound emitting from the Sonos speakers, everything in the bedroom has a purpose and its place. Do you see something ya like? 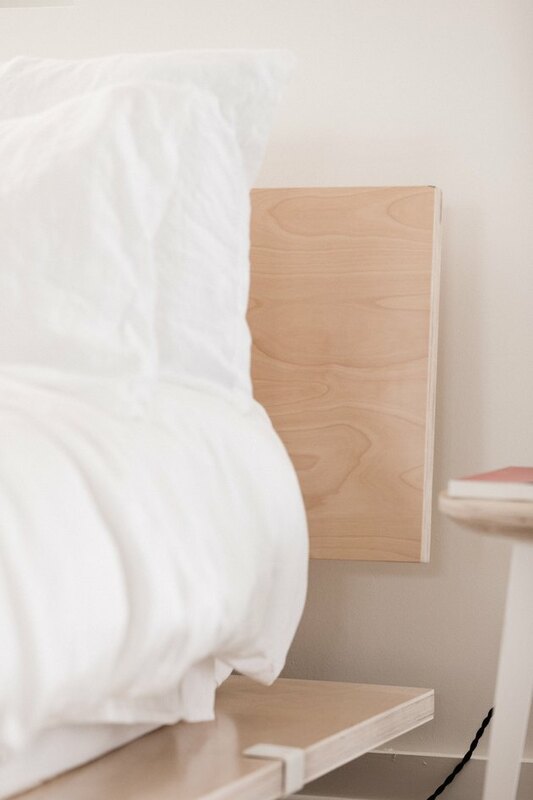 Scroll on for a link to every product you'll find in the Hunker House bedroom. 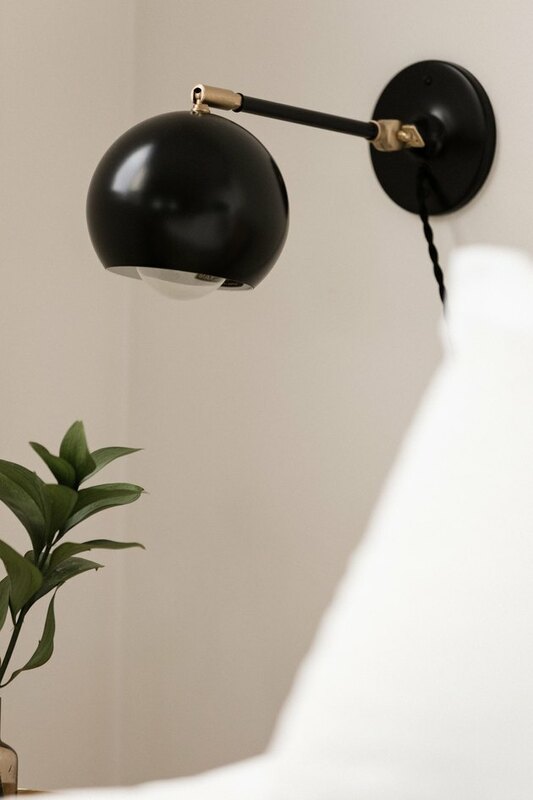 Schoolhouse Electric fused a Scandinavian classic with handcrafted, vintage-inspired materials to create this hand-spun steel sconce (that illuminates a room even when idle). 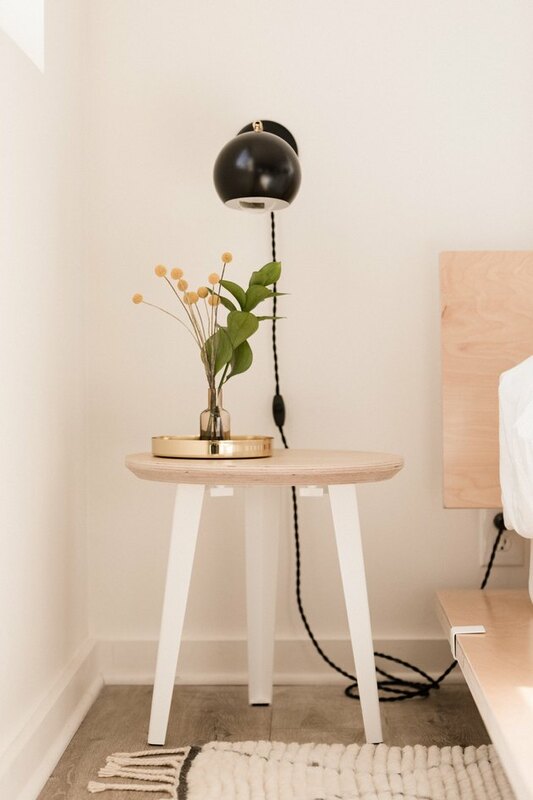 These bulbous little babies will beautifully complement both intimate or group spaces alike, but we think they make a perfect statement as minimal bedside accessories. Here are some all-natural American-made, Grade-A birch plywood panels at their finest. Floyd products do not emit any VOCs and employ a timeless material for its unmatched durability and strength, very much reminiscent of design pioneers such as Ray and Charles Eames, among many (infamous) others. We'd like to piggy-back off of that answer and say, same, plus that we went for the optional headboard attachment. 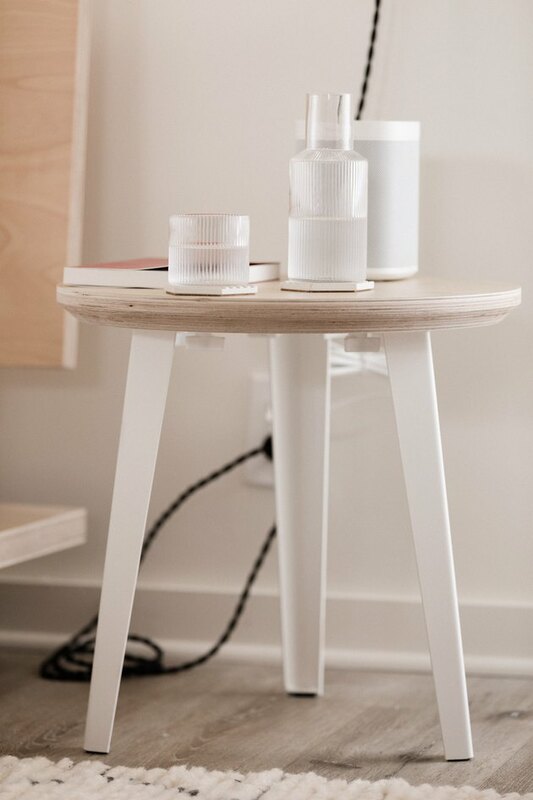 The top of Floyd's side table is made of solid birch plywood (see above birch statement), with the options of either real birch or an all-natural linoleum surface material. And before you wood snobs scoff at your screen, this linoleum is made from pressed linseed in the Netherlands and silky smooth to the touch, yet incredibly durable and easy to clean. 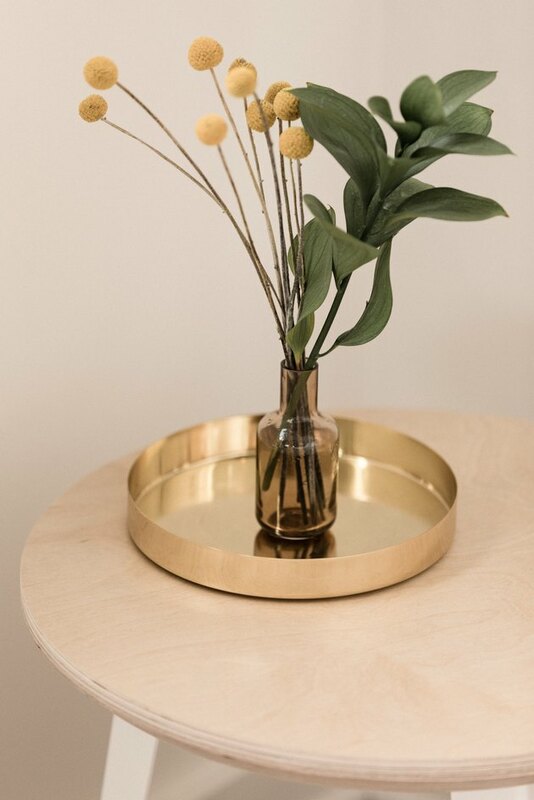 Sleek and modern on their own, these metal trays (in three sizes) also look potentially great in an arrangement. 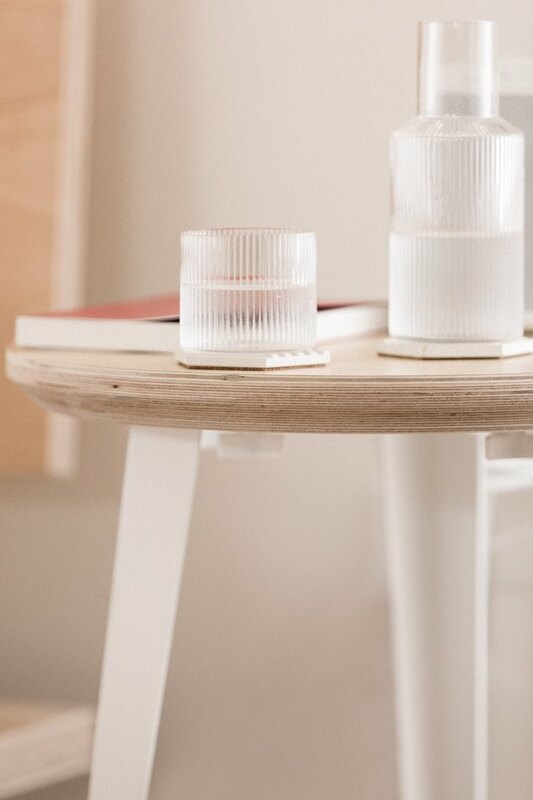 Use them to add a bit of shine for serving drinks (in bed) or as a catch-all for your collection of pretty bedside objects. Choose between brass or copper. 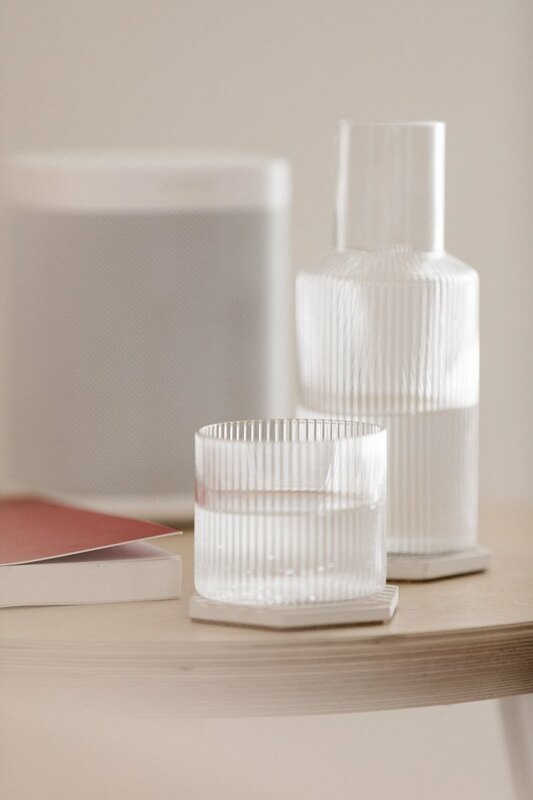 Stay hydrated all day long, starting first thing in the morning with this handy little carafe and glass set, which doubles as a lid for the carafe. (We love a cute and sanitary moment.) The set features rippled mouth-blown glass, holds 8 ounces, and is dishwasher safe. 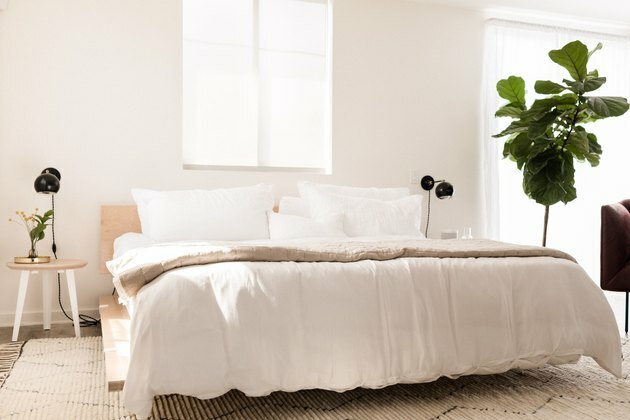 May we just point out how seamlessly the all-white Sonos One speaker blends into a white bedroom. These small-but-mighty speakers play music, radio, podcasts, and more; have Amazon Alexa voice control, a powerful four-core processor for efficiency, are humidity resistant, plus Apple AirPlay compatible with iOS devices. The current One generation has increased memory and an updated processor, plus all Sonos products are buildable, so you can buy a single speaker today and keep adding onto the system until you reach home-stereo heaven. These concrete coasters can be arranged to form a tiled trivet, and the way they give the illusion of 3D through color and clever geometry allows for endless permutations, encouraging playful mosaic building on your bedside (or any) other table. 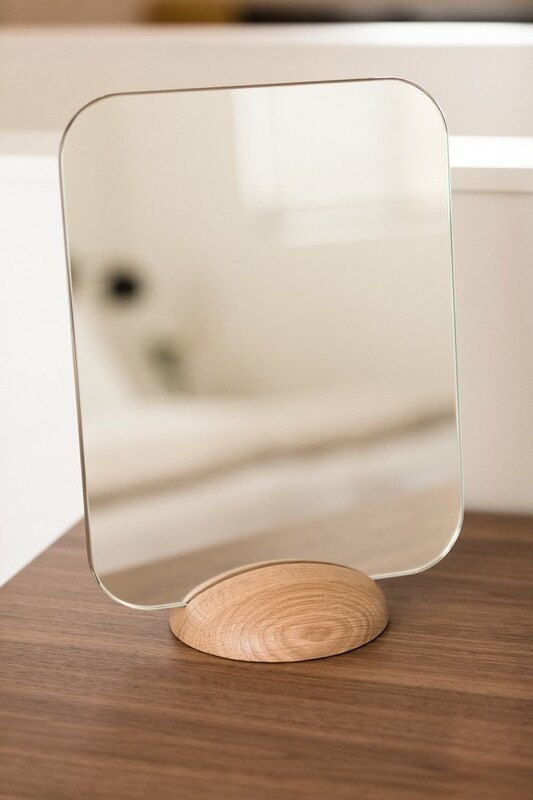 This minimal table mirror can stand in the wood base either vertically or horizontally, and makes the perfect bedroom make-up mirror. Really, this piece is so versatile it can find a place in any room and comes in either natural or smoked oak. Out of all the options out there, this sheet set and duvet cover ended up in the Hunker House as a result of its extreme softness. The fabric is made from 100 percent organic bamboo lyocell and has had a feathery soft feel since day one. These sheets are also extremely breathable, thermoregulating, and hypoallergenic. Oh, and save only 3,031 gallons of water yearly compared to cotton. NBD. We just like the sound of woven Belgian flax, honestly. 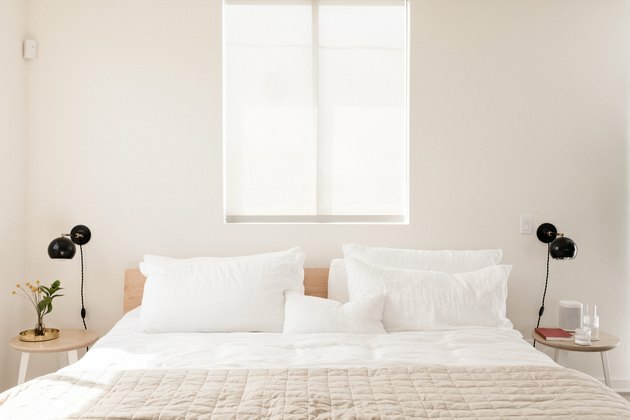 This linen quilt proves to get more cozy with every single wash and its breathability and softness will keep you cool in the summer and warm in the winter, making it a natural choice for the bedroom. And to top it all off, of course, is the luxurious mattress that could make or break an overnight stay. Our choice comes in three options: plush, medium, and firm, and is broken up into an 11.5-inch hybrid coil mattress plus a 3-inch natural latex pillow top for supreme comfort. This 100 percent handmade rug melds high and low pile together with a pared-back pattern inspired by traditional monochromatic tribal designs. We love that it brings texture and warmth to our otherwise contemporary bedroom space (plus it comes in four sizes, all the way up to 10 by 13).